Best time for Uganda Safari: The best wildlife viewing months in Uganda are during the Dry seasons from June to August and December to February. Primate walks in the forest are a big part of any safari in Uganda. The habitat of rainforests is, by default, very wet, and one can’t avoid rain completely. Uganda is a great destination to experience wildlife viewing in both forest and savannah. Not to be missed is gorilla tracking in Bwindi Impenetrable Forest; while chimps can easily be spotted in Kibale National Park. Queen Elizabeth and Murchison Falls national parks offer wonderful savannah safaris with good wildlife viewing. You Visit: Murchison Falls, Bwindi Impenetrable Forest, Kibale Forest, Queen Elizabeth N.P, Mgahinga Gorilla, Volcanoes National Park, Lake Mburo, Bunyonyi and Ngamba Island. Every Uganda tours traveller knows how the attitude of local people can influence the experience when visiting a new country. When going somewhere new, we want to learn about other ways of living, we want contact with new cultures, we want to connect with people whose lives are so different but somehow so similar to ours. People in Uganda are friendly, open and curious with a great sense of fun. They’ll be very happy to see you travelling in their country and they’ll often wave, smile and call you “Muzungu” (white men) not in a derogatory way, but in a friendly, welcoming and to be fair, amusing way. If you think that everything south of the Sahara is arid, yellow and inhospitable, you are definitely trapped in a cliché! All you’ll see on Uganda tours is the green emerald colour that dominates the landscape. The lush and luxurious jungle which characterises the rainforest is replaced by banana, tea and coffee plantations around the villages making the long drives exciting and varied. You’ll be amazed to find out that Bwindi impenetrable forest (A Uganda Safaris favourite) features more than 1,000 flowering plant species and almost 200 different types of trees, many of which are endemic. It is no wonder that this precious ecosystem is home to an incredible variety of birds, butterflies and mammal species including some of the rarest animals on the planet. It’s becoming increasingly difficult to have the feeling of travelling to a remote area, sometimes even in Africa. The often bumpy, rough roads of Uganda’s national parks will make your Uganda safaris experience truly edgy and fun. Uganda is an African success story and whilst being adventurous and unspoilt, it is now a very safe country to travel to. Primates are so amazing that you’ll often forget about some of the other incredible wildlife that lives in Uganda. However, while you adventure on Uganda tours, you’ll be thrilled to see herds of water buffalo in Queen Elizabeth National Park and watch hippos and elephants playing in the water of the Kazinga Channel. Take hundreds of photos of colourful birds, lazy crocodiles and elegant antelopes. If you are very lucky, you could even spot the famous tree climbing lions in Ishasha and if you are outrageously lucky the even more elusive leopard! Primate treks are of course a big highlight of Uganda tours but there’s more to Uganda than this. Kayaking in Bunyonyi, a gentle trek on the slopes of the Rwenzori Mountains, or a walking safari in Lake Mburo are only some of the Uganda safaris options. You’ll love the gentle trek to the waterfalls in Bwindi; spellbound, watch hundreds of colourful butterflies on the paths and listened to the multitude of birds singing in the forest as if it was the most beautiful concert I had ever heard. Lakes, waterfalls, channels; the water element is prevalent in the Ugandan landscape which even features the source of the mighty Nile. Apart from allowing the lush vegetation to survive, this precious element adds to the beauty of the scenery, makes the Uganda tours activities on offer varied and exciting and is the habitat for many species that otherwise wouldn’t be able to survive. Gorillas are endangered creatures and the only way of helping them to survive is to get involved! A gorilla trekking permit is not cheap but the experience is worth every penny. By puchasing one you will be contributing to the survival of these marvellous primates and the conservation of their rainforest home. Although the gorilla trekking has to be the main highlight of Uganda tours, when it comes to outstanding moments, the chimpanzee tracking is up there with the best of them. Kibale National Park has the biggest population of chimps on earth and is the best place to observe them. You’ll be impressed with our rangers, a lovely and experienced and can be able to recognise any odours, sounds and tracks in the forest. The chimp trek is a fantastic experience and is quite different from the gorilla trekking as it involves being very vigilant and fast to understand where the chimps are and how to find them. As you finally hear them screaming, you’ll be absolutely thrilled when you saw them coming towards you. Only a few metres away, they wont seem bothered by your presence. As they slowly merge back into the forest after their brief procession, your day will be made! Uganda tours and wildlife enthusiasts know that a gorilla encounter is the ultimate wildlife experience. Unlike the chimps, which can be more difficult to spot, you are pretty much guaranteed an encounter with the gorillas. The anticipation and realisation that this is actually finally going to happen, keeps you awake almost all night! You absolutely must go to Bwindi Impenetrable Forest and do the gorilla tracking. And spending an hour with a gorilla troop is possibly one of the most memorable and amazing experiences of you’ll encounter. Queen Elizabeth park is close to Bwindi, and is remarkable for having lions sleeping in trees (the only place in the world apparently). Despite being one of the smallest national parks in Uganda, the swaying savannah grasses and riparian habitats of Lake Mburo certainly pack a punch. They come spotted with buffalo herds and zebras, crossed by prancing reedbucks, and stalked with hyenas. Hidden away in the northern reaches of Uganda (in one of the more dubious and unsafe parts of the country), the Kidepo Valley National Park is a great fly-in visit. It’s sat a whopping 700 kilometers from the capital, and is known for its remoteness. Uganda’s tropical climate is a little different in the north and south of the country. From March to November, the north experiences a rainy and warm Wet season, followed by an almost equally warm Dry season from December to February. The south, on the other hand has a pair of Dry seasons (December to February, and June to July) broken up by a pair of Wet seasons. The country’s higher altitudes get predictably cold, with the temperature dropping 6°C/3.5°F for every 1000m/1000ft you climb. 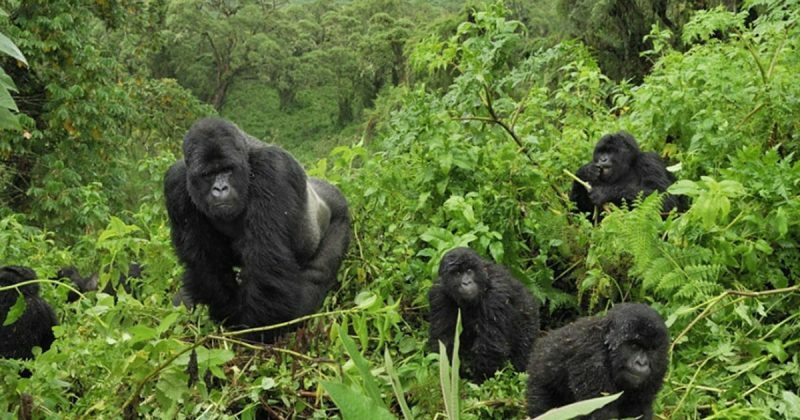 Gorilla permits for Bwindi Impenetrable National Park and Mgahinga National Park are costing $600 USD per permit per trekking per person. Uganda Wildlife Authority 2018 to 2019 has not offered discounted rates on gorilla and chimpanzee permits, the prices will be maintained at $600 and $150 gorillas and chimpanzee permits, Uganda Wildlife Authority (UWA)has always been reviewing its prices and tariffs every year to $450 during low seasons, April and November. Ugandans/East Africans – 250,000 UGX. Rwanda the price for gorilla permit is $1500 USD per person, please do not hesitate to contact our offices for more details on prices and costs of gorilla permits. The most easier way of getting a visa to Uganda is by purchasing it at the entry point, Entebbe Airport or any border station. This is very possible for tourists. All you need to do is pay USD 50, fill in the application form with passport dates and information. The visa fee of USD 50 usually runs for 90 days. You can also get a visa by applying online if you a citizen of the following countries, USA, UK, South Africa, Russia, Japan, Italy, India, Germany, France, Denmark, China, Canada, and Belgium. All you need to do is to download the application from the embassy website of your country of origin or follow this Uganda Imigaration link https://visas.immigration.go.ug/ to start the visa process. You will need to attach 2 passport photos. Every traveler must have a valid passport of nationality or origin issued by their Government. Its safer to have the International Inoculation Certificate against yellow fever. You may also be asked to show your return ticket. This is usually not asked. Uganda’s raised topography means a cooler climate than its equatorial setting suggests but if you’re planning a gorilla trek, it’s important to know when to go to Uganda for the easiest trekking conditions. Although it’s regarded as a year-round activity, the best time to visit Uganda for gorilla trekking is during the country’s two dry seasons: January and February and from June to September. Game viewing in Uganda’s savannah parks is best at the end of the dry seasons – February and March and September/early October – when wildlife is concentrated around water sources. Bird watching is fantastic all year round but is at its peak between November and April when migrant species are present.